Honestly, I thought it would be very difficult to get there. Lately, Terrans are fearing Protoss and it was definitely difficult in practice. I’m glad I was able to make it through like this. It’s my first finals in a long time so I am very excited. Rather than this finals being the fifth, the important point is that this is my first finals of this year. I fell behind a lot at the beginning of this year so I’m ecstatic about making the finals of GSL. My condition is always bad so I don’t dwell on it. It’s been like this for over six months. I know I won today but I’m not too happy with how the games were. However, I can’t help it since my health isn’t so great. I wasn’t trying to go for some special strategy nor did I practise a ton. I just wanted to play according to the situation. This approach worked out. Parting’s PvT has been so strong lately. His clutch defence in particular was impressive but you demolished him today. Before today, Parting just defended against everything and got the composition he needed to win. Today, he went a bit overboard. I’ve been talking to him since ro8 and he said time and time again that he would make the finals as long as he got to ro4. Since then, I expected to win. Overconfidence can be anyone’s downfall. I think a lot of people did cheer me on because a PvP finals isn’t all that interesting. I worked hard because I wanted the finals myself not just because people were cheering me on. As a finals opponent, Squirtle or Hero? Both have a style difficult to deal with. We’re not that close but I am acquainted with Squirtle whereas I don’t know Hero at all. Also, I’ve lost to Squirtle in GSTL in the past. If we can have a repeat of that experience, it should be fun. AX-Korea is a place where you have already experienced a championship. You must have a good feeling. It’s close to my house too. It will be helpful for me in taking care of my condition. I have great memories of that place so I feel very confident. Parting had fewer units than expected. The thought of pulling SCVs came to me and I made sure by scouting that it would work. You chose a 1-1-1 in Set 2. Was this planned? Not exactly. However, since I took Set 1, I felt that I would cause a mental breakdown if I won with a 1-1-1 in Set 2. It worked and I was able to play the match out comfortably. Set 3 was setting up to be a long game but you lost. I was planning to win even it went to late game. My units got split up which was careless of me. That’s why I lost. There is no player with 4 GSL championships. You must want this quite badly. I honestly do. However, I’ve been on a huge decline so rather than focusing on a fourth championship, I will play with the mindset of I will win this one match that’s in front me. I think I will place too much pressure on myself if I keep thinking about the fourth championship and not play at my best. If I’m honest with you, your performance this season was a little disappointing at times and looked quite unstable. How did you make the finals despite all that? There’s something I always feel. Winners will win. I think I’m a winner. On some days, things work out and on other days, nothing goes your way regardless of how hard you try. Last season was the latter. This season is a season where everything goes right. As Kespa enters the Starcraft 2 scene, fans are already hyping up the match between you and Flash. It will be fun to play against him. However, I’ve seen recent articles about Starcraft 1-Starcraft 2 running in parallel. Frankly, the two games running in parallel is too hard on progamers. I’ve played Starcraft 1 from time to time as a Starcraft 2 gamer and it feels way too different. I regret the fact that Starcraft 1 gamers have to play two games at once. I think the people who decided this were too selfish. They didn’t consider the players at all. I want to thank YongHwa, Ready, Seed, and Anyppi for practice. I want to thank MC, San and Oz as well. I want to thank my parents and my older sister who cheer me on from home. My parents were sad because I wasn’t able to get to the finals lately. I am proud to have made the finals this time. I want to thank my coach who always works hard and Nestea lost in Round 2 of Code A yesterday but I have no doubt he will smash his way through UnD. Lastly, I want to say thank you to my girlfriend. When I first started playing in Code S, ro16 was the goal but somehow, I’ve reached the finals. It’s like a dream. People always told me that I was good in GSTL but I would keep losing in GSL. I was even starting to develop some kind of phobia for GSL. I have been practising consistently so it must be my efforts bearing fruit. Every player aims to stand on the stage of the finals. I did feel like this goal was getting away from me as I kept on losing. However, I was able to come this far precisely because I never gave up. Not giving up is the key. I’ve never thought that I would step on the finals stage. To be in the finals of this season, I was overcome with emotion. It’s like a dream come true. Many thoughts came to me. One final test remains. You took a close second place at IPL 4. Don’t you want to change that this time? I felt firsthand how much you can regret coming second place after losing to aLive at IPL 4. This time, I will work my hardest to win. Hero was looking quite strong too. Were you expecting to win 3:0? I thought I would win 3:0 if I took Set 1. If I had lost Set 1, it would’ve been a much more difficult match. I actually wanted to maintain that 100% win rate. I couldn’t ignore it once people kept mentioning it to me. I receive help in PvP from Ace, Naniwa, Sase, Tiger, etc. They have helped me so much. We’ve discussed PvP quite a lot. Your opponent in the finals is MVP. A match against Parting didn’t come to fruition. I really wanted Parting to advance but facing a player from another team is easier. Since it’s MVP, I think I’ll feel more at ease than I would with a teamkill. MVP took down Parting, the Terran Killer. What were your thoughts? It reminded me that MVP is a three time champion and that he’s on another level. His planning for a long series was exceptional. However, I have a lot of experience as well and I can plan out a series quite well too. There is plenty of chance for me to win. To take on MVP who has such a wealth of experience, you must have to prepare yourself outside of the game as well. If I were alone in having to prepare, I would have been worried because of my inexperience. However, I have faith in my team’s Protosses. If we all come together to practise, I can win. Startale has Bomber. He should be a great help in preparing for the finals. In fact, the player I’ve talked to the most. We share the same room and we talk about the game a lot. I expect a lot of help from him with the finals as well. Shouldn’t you change your ID to Blastoise once you win? If I win, I’m thinking about changing it to Blastoise. Since I haven’t won the championship yet, it’s Wartortle. My parents always advise me to stay calm before a match. I’ve kept them waiting for too long since Starcraft 1. Now that I have made the finals, I can relax about that a little. I really want to take the championship as my parents watch on. Fans are still talking about that match, it seems. I want an even greater match than that. I will provide a PvT worthy of the finals. Honestly, I don’t think I’ll have enough room for a mothership in a finals against MVP but I hope people think of it as me showing my confidence. I want to thank my sponsors: Zowie Gear, Red Bull and BenQ. I got a lot of help from Naniwa in preparing for my match against Taeja and now he’s angry at me because I forgot to mention him in the winner’s interview. I want to take this opportunity to thank him. Also Sase who helped a lot with today’s match. Tiger played around 200 games with me to help me practise. Ace helped me until early morning as well so I am very grateful. Well, it looks like once against MC is going to practice with one of the finalists against the Protoss. Will MVP win this time? He has a gf? LIKE A BAWS MVP!!!!!! The King returns for his throne!! thanks, hehe, I'm so happy that MVP won. Either we get a 4 time champion or a royal-roader victory and the first protoss gsl win in over a year, It's going to be a great finals! "If I’m honest with you, your performance this season was a little disappointing at times and looked quite unstable. How did you make the finals despite all that? " Thx for the translation as usual . well done mvp. Interesting point about SC1 and SC2 in parallel. Oz you dirty little man, helping out MVP against Parting, lolz. I never really considered that perspective. I think MVP makes a great point. storywriter's translations are SOOOOOOOOOOOOO good. Squirtle gladly accepts your invitation to dance MVP. Hopefully Squirtle crushes MC's hopes. surely it is "hear hear"? The one true king bows to no odds. I want to thank MC, San and Oz as well. I thought MC and Parting were quite good friends, but I guess I was wrong. I’ve been talking to him since ro8 and he said time and time again that he would make the finals as long as he got to ro4. Since then, I expected to win. Overconfidence can be anyone’s downfall. Such as badass interview. Thanks storywriter. They are good friends, and so are MC and Mvp. Most players are friends, a lot of these so-called rivalries are just in the spectators heads. I guarantee the players don't actually see the scene the same way as the casual community does. Classy as always, Mvp. Being very considerate for his former BW compatriots. Great and speedy translations, thank you! Also, last time, I seem to have offended MC but it’s all a misunderstanding. He took care of me like I was his son at MLG. I am really grateful and I love him. I will treat him something nice with my GSL winnings. Note that was in jest. If anything that's even more proof that Parting and MC are very close. "My parents were sad because I wasn’t able to get to the finals lately." Artosis: "You need to hold my hand." Tasteless: "I'm very good at that." MVP! MVP! MVP! MVP! MVP! I jumped off my seat during the last game with the doom drop! LOL , MC & and Oz training with MVP.. that's hilarious. Winners will win. MVP so badass. MVP! MVP! Good Luck at the finals! I'll be sure to watch instead of playing d3! Not to mention practising with someone like Mvp is really good for themselves as well. I'm even more of an MVP fan now, and he has become my all time favorite Terrran player. No matter the situation, in spite of his injury and even with his most recent performances, MVP still manages to find the strength to play to the best of his ability and win games even when some of us didn't even give him a second chance. All Hail The Baddest man in the planet! The God of Sc2! MVP! Go win this please! 4th GSL! Woohoo thanks for the Squirtle interview! Really good interview! Well, his ID is now Wartortle. Confirmed. If Squirtle wins and changes his ID to Blastoise I will mark out. All Hail MVP! All Hail the king of terran! "I got a lot of help from Naniwa in preparing for my match against Taeja and now he’s angry at me because I forgot to mention him in the winner’s interview. I want to take this opportunity to thank him." Squirtle is too adorable to be a real person and MVP continues to be a boss. Damn, the storylines leading up the finals is getting epic. REALLY looking forward to the finals!!! You should add a "Donate" button to your threads, storywriter. As always, thanks for your great work. Squirtle please win the finals! Dear God I've got nerd chills. HES NOT A BONJWA GUYS! Did any bonjwa ever slump and came back? Given the volatility of the sc2 scene: MVPs "slump" is a great record for absolutely any other player. He's the best player in sc2 overall. He can be beaten, but it's always a shock when he is. MVP making sure Protoss lategame stays the way it is... That'a boy! Nice finals incoming for sure, and these will be hard to call, but the edge has to go to MVP. Bomber: "FML, another week of god-damn TvP"
I'm pretty hyped for this, I wanna see MVP take down another title, but I wouldn't be too sad if Squirtle won either. Interesting what MVP has to say about the new Proleague. Season 1 Champion came from Ro24 Code A. Lets see if it switches this season. "If I win, I’m thinking about changing it to Blastoise." i just wish mvp's wrists were good :'( but gl i hope he wins! Squirtle Fighting. Or should I say... Blastoise!?!? Also, I’ve lost to Squirtle in GSTL in the past. If we can have a repeat of that experience, it should be fun. Hail to the king baby!! 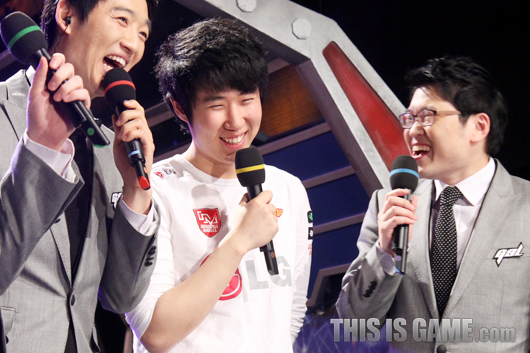 Mvp's 5th GSL final apperance. How many GSL's have their been? Either way thats a significant chunk that has Mvp!!! Feels like MVP will win this GSL now with relatively unimpressive play from beginning to end. Disappointed in parting. Wartortle's evolution is almost complete. I eagerly await the day when he becomes the Blastoise. Better than someone winning who will probably never make it far again..
Haters gonna hate. Winners gonna win. Come on, #4 for Mvp! Dont wanna be rude or anything but I think that MVP is most likely the only deserving one to win the GSL from Ro8 players. When I look at the other players in Ro8, it feels like it's just a metagame thingy (or balance, I know it's taboo talking about it..) going on and the other 7 players arent GSL Finals material at all (maybe Parting tho? )..there are better players than the Ro8 players that dropped down or didnt make it to Ro8, like MMA, Leenock, NesTea, Alive, MC, DRG ..etc. hopefully MVP wins the goddamn final now. To be honest they are balancing it at the highest levels of play, I'm sure they can see Protoss is in a very strong place right now. Problem is that at this level it doesn't matter what the race balance is like, it's just about strategy and mindgames; like Mvp said he's punishing PartinG/NaNiwa for going for being too greedy, and that's the reason he's winning. Proper macro games undoubtedly end with Protoss winning unless they're heavily crippled early on, so most of the TvPs will look like all-ins until Blizzard decides the match-up is not working out. MVP will take the finals, though it will be a close series. Still, all hail to the king! Winners will win. If you make no mistake, yet still lose - you don't understand the game. Spiral out, keep going. Don't forget to prepare for your own match, Bomber. To be honest, before todays games I thought Blizzard was stupid and utterly wrong with their statement. After today´s games I have to say they are only partially wrong. Protoss was too greedy and Mvp showed us how to deal with it! MVP's victory shows us that strategy and intelligence triumphs above all else. His wins were because he made the correct decisions while Parting made bad ones. Game one Parting screws up and randomly moves out before storm finishes. MVP read his build correctly and went for 5rax kill instead of 3rd cc. Game 2 Parting neglected to flank the 1/1/1. Game 4 he could have denied the drop by positioning his stalkers closer to the edge. Instead he was greedy and tried to kill the drop as it was coming in. No matter how far MVP's physical condition deteriorates, he'll still have this strategic decision-making edge + he has lots of experience playing on the big stage and no nerve problems. 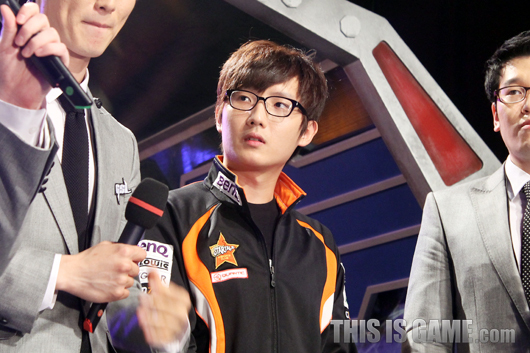 ""Parting’s PvT has been so strong lately. His clutch defence in particular was impressive but you demolished him today. Before today, Parting just defended against everything and got the composition he needed to win. Today, he went a bit overboard. I’ve been talking to him since ro8 and he said time and time again that he would make the finals as long as he got to ro4. Since then, I expected to win. Overconfidence can be anyone’s downfall."" WHy are you SO SMART mvp? “It's like poker. You can play your best, but you've got to know when to fold your cards and take a rest, and know when to hold your cards, hold your breath and hope that nobody else is stacking the deck." hahaha MVP comes out and says he didn't even practice that much. dude is a total baller. even though his wrists hurt his mechanics and unit control, he is such a cerebral player that he still is arguably the best in the world. HAHAH MVP proved all you WRONG! And his parallel comment is really amazing. He's so nice, no matter what he's talking about. That's why I honor and respect MVP. I really root for him and hope him to win the final! GoGo MVP. Hail to the king! but Blastoise sounds pretty awesome. I never EVER understood why people put Mvp next to Nestea...not even on the same level. Ever. you're saying MVP is lacking mechanics? go watch MVP's pov from his stream. You're talking about a guy who would rip apart any of those players in BW (the game that relies heavily on mechanics). Are you implying that Mvp better or worse then Nestea? Nestea did win GSL by NEVER dropping a game. He doesn't have the micro right now because his wrists are detonating. And even so he still splits marines really, really well. Once he sorts his wrists out, he's as mechanically sound as MMA or DRG. Combine that with his awesome decision making and clever build orders, and he's a champion. I can't see him losing in best possible shape. Everything else seems pretty much spot on. I don't know what to say about Squirtle because I didn't see his games last night, and I missed most of IPL4. Hopefully MVP and Squirtle bring an entertaining series at least, though I do expect it to be short.